Set within the beautifully landscaped gated community of Rosedale Golf and Tennis Country Club in the Bradenton/Sarasota area, this luxury family 3 bedroom, 2 bathroom home has been furnished to an extremely high standard and has amazing golf course view. The open floor plan has cathedral ceilings, which gives a light and airy feel and includes a large kitchen with breakfast area, a spacious lounge with formal dining area, a master bedroom with ensuite which opens directly onto the pool area plus queen size and twin size bedrooms and family bathroom. Cable TV and DVD in the living room and all three bedrooms, FREE phone calling within the USA and Canada, high speed internet access and printer and even a docking station for your ipod! The large heated pool area is very private with stunning views, hot tub, luxury patio furniture and BBQ. Four bikes available - 2 adult and 2 child. We traveled to Sarasota and the Bradenton area over 10 years ago and kept coming back as we could find no other place quite like it. As a family of four, with young children, we needed a holiday home that had something for everyone. We certainly found it here. Rosedale is a quiet and safe gated golf and tennis community and the villa is directly on the golf course although very private. The location is great, just off the I75, so there is quick and easy access either North or South, to downtown Sarasota for great shopping, restaurants and bars, museums and theatre, and North to the beautiful beaches of Anna Maria Island. Nearby there is the lovely community of Lakewood Ranch with another superb golf and tennis facilities open to the publi. Main Street is great for shopping and bars and restaurants. There is so much to see and do that we always run out of time trying to fit everything in, but it's so nice to be able to come back to the peace and tranquility that this villa has to offer. Our villa really is home from home. From the moment you enter you will feel immediately relaxed and at ease. With it's peaceful location overlooking the golf course and with lake view you can choose to do as much or as little as you like. Having visited many villas in the past we understand the frustrations that parents have when holidaying so we have ensured that the villa is totally child friendly. Our days are packed with playing golf, lots of tennis, visiting theme parks in Tampa and day trips to Orlando. With beaches closeby, we often spend the morning on the beach, lunch at St Armands Circle and a lazy afternoon by the pool. Friends and family love to come and visit, especially grandparents who are keen golfers, as there are so many different golf courses nearby such as Tara, Peridia and University Park, which are all open to the public. For keen golfers you'll be spoilt for choice! This is a great home in a lovely golf community. All amenities are included to make your stay comfortable. The outdoor lanai, pool and hot tub were fantastic to have in the hot weather we experienced in November. 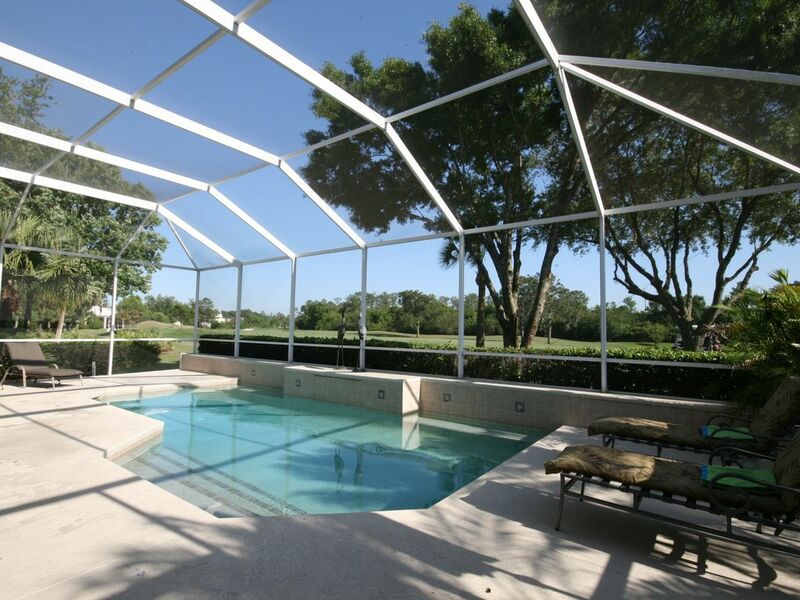 This home is located near many golf courses, excellent shopping and many attractions. The beautiful Bradenton beach area, Anna Maria Key and Long Boat Key are within a half hour drive. Being close to major highways makes it easy to access attractions in Tampa as well as travelling south to Naples. Many thanks to the owners who thoughtfully communicate regularly to make sure Guests are comfortable and happy with their rental. Overall, this property is a 5 star rental. We enjoyed our vacation at Rosedale. excellent accommodations with fully equipped home that had everything you would need. Excellent location. Minutes to shopping centers and food stores. Enjoyed a trip to Siesta Key beach. Weather was beautiful! Beautiful home with everything you might need to make your stay as comfortable and stress free as possible. Thank you for choosing our villa and taking such good care of everything. We look forward to welcoming you back. Beautiful, spacious and clean house. I went with my husband, two children and parents in law - still it did not feel crowded. Philippa was very helpful and answered our e-mails quick. Would love to come back! It was a pleasure having you! You are always welcome back anytime. Home from home but in the sunshine!! This is a beautiful villa in a very pleasant and quiet area. It is ideally situated for visits to lots of local amenities.It has all the facilities and equipment to enable guests to have a relaxing holiday. The pool and lanai is a wonderful place just to be able to soak up the sun, read a book and watch the golfers on the 5th fairway. The owners are very helpful and will answer any queries you may have . The package of information sent before you travel is very informative, so that when you arrive, the entry through the security gate and entry into the villa is seemless. Can’t wait to return. Outstanding villa at Rosedale golf. Oakley's villa was very nice, clean and fully equipments. Pool was clean with heating possibility. Villa is situated in Rosedale golf area, which is nice and safe. Most of interesting places are near - golf, shopping, steakhouse, but also beaches (30 min. ), etc. We could reccomend. This luxury family villa is set within beautiful Rosedale Golf and Country Club, just off I75, on the edge of Lakewood Ranch and an easy drive to downtown Sarasota (20 minutes). The villa is only 25 minutes to Anna Maria Island, Gulf Coast Beaches and St Armands Circle and 90 minutes from Orlando. Tampa Airport is an easy 45 minutes away and Bradenton/Sarasota Airport is just 20 minutes. There are over 45 golf courses locally, including semi private and public courses nearby. With the challenging Rosedale, Tara and University Park golf courses, you'll be spoilt for choice. There is great shopping nearby with the Ellenton Prime Outlet only 10 miutes drive north featuring 100 shops offering huge discounts! Overall a great place for golfing, tennis, beaches, shopping, theme parks and the wider Sarasota and Tampa area. With Orlando attractions such as Disney World, MGM Studio and Sea World only 90 minutes away there is something for everyone. Golf: 'Stop Here and Smell the Roses' - Pay as you Play Golf . Rosedale provides superb facilities for everyone . . . a wide array of activities for members and guests to enjoy. Winding its way among sparkling lakes and woodlands, the 18-hole championship golf course offers both challenge and breathtaking scenery to the lucky few who come to call Rosedale home. Noted golf course architect Ted McAnlis, a former Fazio team member, has succeeded brilliantly in his quest to keep the surroundings intact, imaginatively weaving fairways and greens through existing Florida forest. While water and sand come frequently into play, some say the setting itself is the greatest pleasure of all. There's an 8-acre driving range for the required time on the practice tee. Plus a chipping and putting green for fine tuning strokes. All prices are inclusive of tax at 12% Pool Heating (recommended between November and April) $150 per week / $450 per month. Final clean $170 plus tax.